“When the polar bears of Svalbard venture from their dens this year, a joint expedition of WWF-Canon and the Norwegian Polar Institute will be there to observe how the bears are adapting to changing sea ice conditions. “Further east” would be towards Russia, to the islands of Franz Josef Land in the North Kara Sea, ~260 km (160 mi) east of Svalbard (Fig. 1). Figure 1. 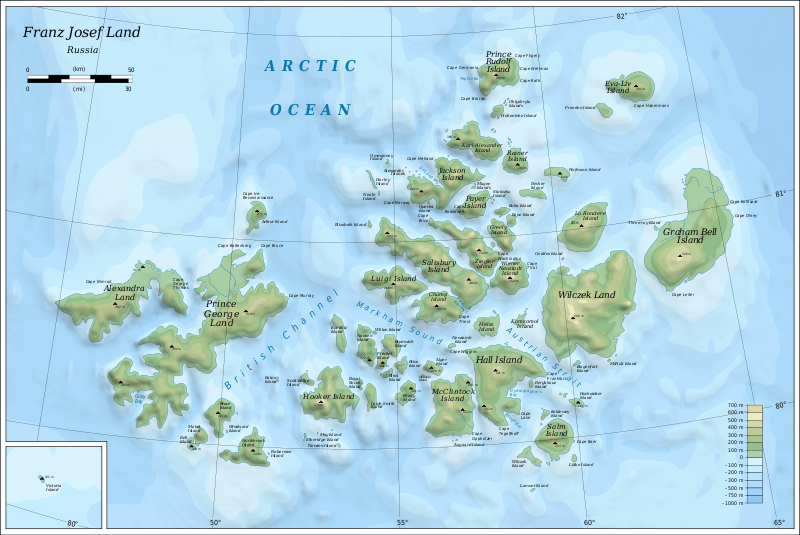 Top, Primary denning areas in the Svalbard Archipelago circled (Kong Karls Land and Hopen Island), map from Wikipedia; Middle, “Barents Sea” popular bear subpopulation boundaries, courtesy PBSG; Bottom, Sea ice extent around Svalbard (circled) as of April 10, 2014, courtesy NSIDC. Click to enlarge. Franz Josef Land looks like a fine alternative – up close (Fig. 2), you can see there are a multitude of islands for female bears to choose from, if they wanted to make maternity dens on land. Figure 2. Close-up of Franz Josef Land, Russia, a short polar bear jog of 260 kilometers (160 mi) east of Svalbard. 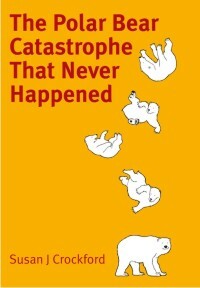 See cool National Geographic video clip of polar bears there. Click to enlarge. It seems there is good reason for this flexibility: variability in spring ice coverage in the Barents Sea is now acknowledged as being due to natural variations in the Atlantic Decadal Oscillation (AMO). Since spring to early summer is the most critical time for polar bears, they need a strategy for dealing with years (or decades) of low spring ice coverage. Figure 3. This is Fig. 6 from Maurizen et al. 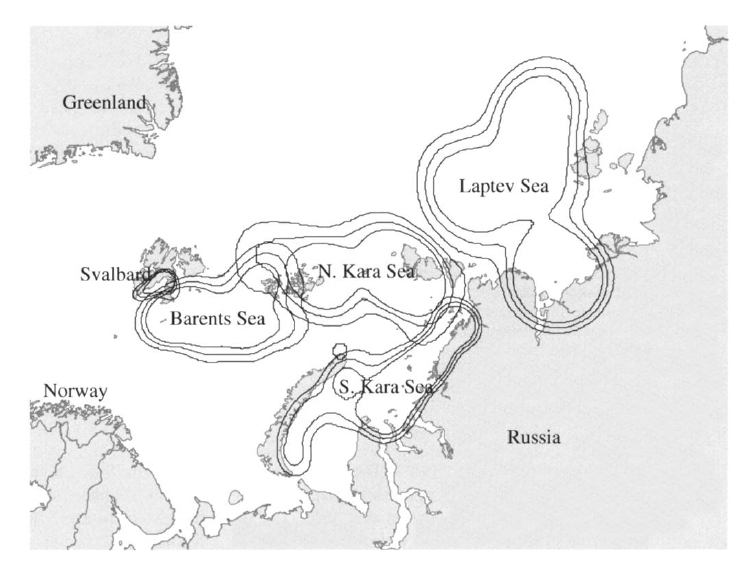 (2002:85), which shows as part of their results, the overlap in the ranges (of radio-collared females from 1988-1999), between Svalbard (Norway) and Franz Josef Land in the North Kara Sea (Russia). Another area where polar bears are known to move around, and where substantial numbers of females make their dens on the sea ice (Amstrup and Gardner 1994) is off Alaska and western Canada (i.e., the Southern Beaufort, Chukchi Sea and Northern Beaufort subpopulations), see previous posts here and here. Figure 4. This is Fig. 3 from Amstrup et al. (2005), showing the overlap of collared from Southern Beaufort polar bears into adjacent Chukchi Sea and Northern Beaufort subpopulations. 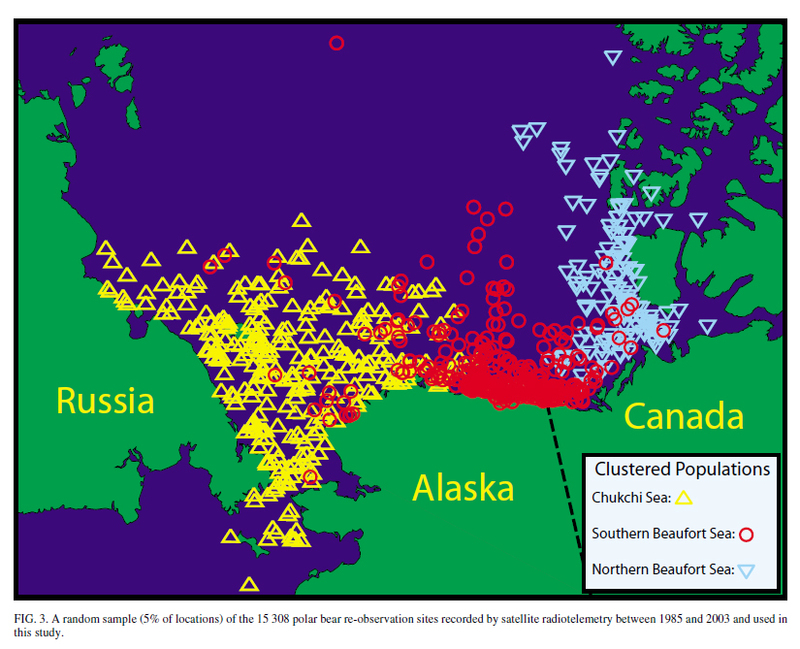 When heavy spring ice conditions periodically develop in the Eastern Beaufort, many Southern Beaufort bears probably move west into the Chukchi Sea, as both ringed seals and bears did during the winter of 1974/75 (Burns et al. 1975). 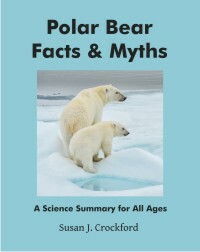 There is evidence of movement of ringed seals and polar bears out of the Beaufort Sea when spring ice conditions were especially heavy in 1974/1975, as they were the previous year (1973/1974). “During the period 9 to 19 June  extensive aerial surveys of ringed seals were undertaken in areas of land fast ice between Barter Island and Point Lay. ..The necessity of conducting these surveys was based on observations during the winter of 1974-1975, which indicated unusually high densities of ringed seals in the Chukchi Sea and the reverse in the Beaufort Sea. Observations for the Beaufort Sea were obtained by [Jack] Lentfer (personal communication). Survey results substantiated that a major, short-term shift in density had indeed occurred. Density of seals in the Beaufort Sea was down 10-fold with a corresponding increase in the Chukchi Sea of between 10 and 15 fold. Communications with Canadian investigators indicated that the decrease of seals in the Beaufort Sea was not restricted to the areas north of Alaska, but were also similar in the Canadian sector including Amundson Gulf. Bears that could move out of the Beaufort (adult males, subadults and adult females without cubs) would be the most likely to head west toward more fertile hunting grounds in the Chukchi. Most females with newborn cubs would have had to tough it out in the Beaufort: we know from reports that many lost their litters (and a few died themselves). Overall, however, the population rebounded quickly over the next few years when spring ice conditions improved. Such totally predictable (and well documented!) 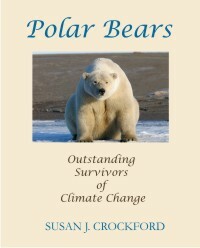 adaptation and resilience — why would anyone, let alone a polar bear biologist, think that a species that had survived several glacial to interglacial transitions would be done in by changes as slight as we have seen over the last 30 years? 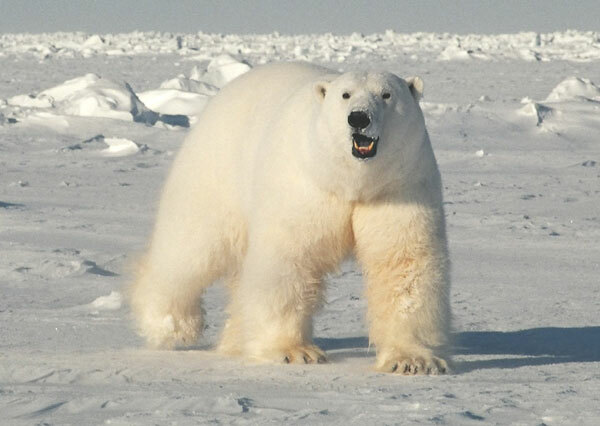 This entry was posted in Conservation Status, Life History, Sea ice habitat and tagged adaptation, AMO, Amstrup, Barents Sea, dens, Franz Josef Land, Kara Sea, Mauritzen, polar bear, polar bear resilience, pregnant females, satellite radio collars, spring ice conditions, Svalbard, WWF. Bookmark the permalink.